Well what a busy month May has been! 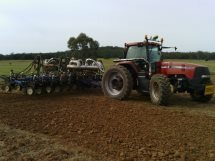 Machines have been busy in paddocks with growers picking cotton, planting winter crop and harvesting sorghum. It’s fairly safe to say that picking is coming to a close in the north, and planting is slowing down in the border region with growers either completing seeding or grinding to a halt due to moisture falling away. 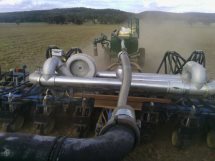 Other’s are yet to get a planter in the paddock without more rain. Harvest has been a bit stop-start on the Plains region with small falls of rain creating slight delays and some paddocks just not wanting to dry down. There are generally two times a year that growers have conflicting feelings about receiving rain. Whilst we are in desperate need of rain, those still trying to harvest/pick summer crops are hoping to do so prior to significant rain. Most of these growers, however are also in need of rain to get winter crops wither planted or established. Sorghum values were on a bit of a rollercoaster ride throughout May as we experienced quality and delivery issues off the Liverpool Plains. This culminated in a meeting at Spring Ridge on Friday (30th) where discussions were had around receivals, quality specifications, international versus domestic markets versus human consumptive markets. We are unsure which direction this is all headed but rest assured some changes are coming. Newcastle track values spiked to $345/mt during the course of the month due to growers needing to washout of existing contracts. Frustratingly, this was not due to production failure as they had the tonnes, but due to quality not meeting spec. By Friday afternoon all bids were pulled from all merchants as any chance of May delivery against ASX track contracts had expired. Wheat values peaked at $375/mt delivered Downs & $383/mt delivered Brisbane on the 12th of May and ended the month at the lows of $360/mt delivered Downs and $375/mt Brisbane. Demand remains strong for any feed grain, with growers continuing to price into the spot market rather than deferred delivery. New crop sellers are thin on the ground with most unwilling to commit to production risk without another fall of rain. Chickpeas during the past month haven’t seen too much activity from wither the demand or the sell side. Values remained fairly steady and really only fluctuated by $5-10/mt. They ended the month at $460/mt delivered Downs for old crop and $465-470/mt delivered for new crop. In cotton news, rains received in Texas over the last weekend of the month have the market expecting areas that were previously considered for abandonment to pull through. This has added pressure on the new crop December contract and as a result the inverse from July to December is now out to just over 7 cents/bushel. We may see some short squeezing of the July contract occur but don’t expect that any upside will be reflected via physical demand from the Mills. Basis ended the month slightly stronger, however most merchants are only looking to accumulate bales for June/July as they are unsure what will happen to the inverse as it draws July closer to dropping off the board and don’t want to take on this risk. Over the past 90 years WFI has become a leader in rural and business insurance and understand what you’re looking for when insuring your assets. Unlike our competitors, WFI and AgVantage Commodities pride ourselves on building lasting relationships with our clients. That’s why we prefer to deal direct with our clients either face-to-face or over the phone. When you deal with us, you deal with a local person who genuinely wants to help you and understands your business, not someone on the end of a delayed line from the other side of the country or the world. WFI’s business model is based upon providing clients a direct, personal service. Our area manager is available to visit clients on farm, at work, at home or at one of the WFI offices. With back up support strategically located around the country, WFI are good people to know. WFI offers a range of polices and covers designed with rural businesses in mind. As well as being simple and easy to arrange, you can tailor your insurance to best meet your requirements and budget in one fully integrated plan. For more information or to request a quote please call the AgVantage Office on 02 6792 2962 or send us an email. AgVantage Commodities has a referring agreement with WFI. If you take out a policy with WFI, AgVantage receives a commission from WFI. This commission is not added to your quoted premium. o 8 June – Rowena Cracker Night, 5pm, Rowena Shire Hall. The US markets were closed overnight for the Memorial Day holiday, but have opened down this morning, continuing to slide lower from last week’s close. Crop conditions and planting progress reports will be released tomorrow, but are expected to show sharp increases in planting pace for Corn and Soybeans. Wheat conditions are not expected to improve dramatically, but the rain falling across the US Midwest is more than likely to stem the downward spiral of recent weeks. The grain markets are lacking any real bullish news, the Ukrainian/Russian conflict seems to be coming to a more peaceful conclusion, European grain production looks reasonably secure and the US renewable fuels mandate does not appear to be reduced as harshly as first expected given grain production looks secure. The cotton market is all bearish losing more than 350 points last week. Certified stocks are continuing to grow, with more than 430,000 bales now in USDA warehouses. Rain in West Texas, the best falls in over 12 months in some places has helped to pressure the new crop market given an El Nino event will likely see the chances of a big dry land crop (1.3M hectares) now coming to fruition. The Aussie dollar has traded in the 0.92’s so far this week, but looks under pressure from the continued speculation about the possibility of increasing the speed of tapering the US economic stimulus. Last week’s RBA minutes pointed to continuing hold on local interest rates for the foreseeable future, and improvements in the US economy could see our currency hurt by investors chasing higher yields. Locally, the forecast for rain has appeared yet again, but at a week out, anything could happen. The nearby markets for domestic grain is holding its breath, wheat having lost ground on last week’s prices while barley and sorghum remain around the same numbers of last week. Track sorghum in Newcastle was full of fireworks last week, but this seems to have settled down quickly. New crop wheat is back from the best numbers seen before planting, with basis between $70 and $80 on for track APW, this is also being reflected in strong ex-farm numbers for new crop 70/10. We still have hectare contracts for faba’s and we have also seen a couple of chickpeas buyers releasing hectare contracts that are worth considering.